Hello! We're the founding members of 1149 Cooperative, a new co-op in South Philadelphia. We're food makers for social change who are excited to share our new space with you. Who We Are: Jena Harris is the founder of foodeveryonedeserves (f.e.d.). 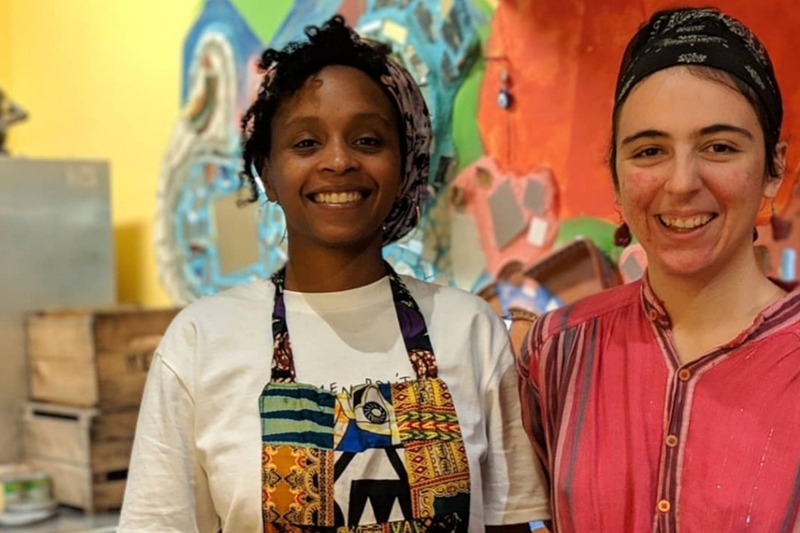 She's been catering meals for organizers and neighbors for 5 years, offering inclusive services for low-income folks and folks with different diets. Ailbhe Pascal is the founder of Fikira Bakery. They've been baking bread and offering meals on a sliding scale, bike-driven basis for 3 years, providing accessible, sustainable offerings. Both Jena & Al teach food classes, source ingredients sustainably, and work with a minority priority. “We have your back”: The 1149 Commitment. We have a mission to provide a seat at our table for all our neighbors. 1149 is a space that proactively includes and involves black folks, folks of color, folks with disabilities, immigrants, women, queer and trans people, and everyone with intersections of these identities. Your inclusion is at the center of what we do. The front of 1149 has room for a collective gallery, community apothecary, and ongoing events. The back of the co-op has room for creators in the food justice movement to incubate their own businesses and collaborate on the 1149 lunch menu. By pooling our resources, activists and artists can create a home for visionary work in Philly. In a moment when most of the city has been impacted by a removal of its history through gentrification, we can hold the legacy of El Compadre (1149’s predecessor) through the community building and organizing that’s happening here. That’s a torch we strive to carry. In Philadelphia, right now, there is no space that mutually uplifts artists, activists, and food artisans. We can build that power together. 1149 needs to raise $30,000 by December 31st to break ground in our community-powered space. We need this support to sustainably grow. Supporting this project supports all of us. **Stay tuned for donor benefits! Thank you to everyone who has donated so far! Please continue to share our story and campaign. We're feeling very blessed to have such wonderful folx connecting with us and offering support. Here's a picture of us snapped by @momanklang from a dinner we hosted Dec 1 in the space. Our first open house is coming up and we will be sending invites and posting that announcement shortly, we hope you can join us!